I always respond to a house that has a lot to say—and a house that speaks three languages is particularly alluring. 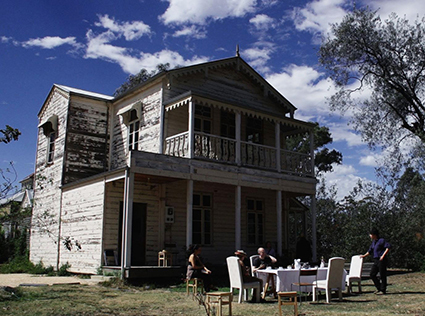 On the weekend of March 21-22, Watford House in Avoca in rural Victoria spoke to a small La Mama audience for a groundbreaking version of Anton Chekhov’s Uncle Vanya. The play’s four acts spanned two days, with various group and private events in between—eating, walking, visiting the Chinese Gardens and processing the intense and unexpected emotions the play evoked in this setting. This extraordinary production culminated a two-year process, working with the location of Watford House—a wooden house, pre-fabricated in Sweden in 1850 and imported to gold-rush Victoria—that has over the past 10 years been the site of artist Lyndal Jones’ remarkable environmental art site, The Avoca Project (TAP) which hosted the production. 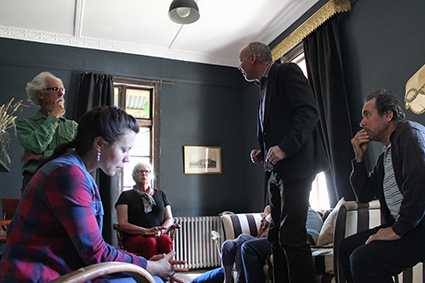 During the weekend, the 40-member audience (that’s all that could fit in the house) listened and rejoined as Watford House’s Swedish speaking walls entered a conversation with an English version of Chekhov’s Russian, improvised into vernacular Australian by director Bagryana Popov, the artistic team, and of course the actors on the day. That weekend in Avoca the fourth wall of traditional theatre resoundingly broke down as the audience perched amid the action, inside and out. Yes, action—I know, Chekhov fans don’t expect action, anticipating instead much talk and a great deal of ennui. But that weekend we were actively on the move: shepherded by the director between rooms, and around outside spaces, then, between acts, making our own way through the Pyrenees. And, yes, there are Pyrenees in Victoria, beautiful, if very dry these days, speaking of the climate change that the characters discuss in the play. Because not only was the text Australian but so too was the context as Uncle Vanya and Sonia became regional Australian farmers, struggling as they do, and the Doctor emerged as an environmentalist, mapping the bush and forests, trying to save what he could. The Australian context also informed the production’s intriguing play with authenticity conjured by the timing of each act following Chekhov’s actual timetable. But this was not some straightforward authenticity, as we came to sense with every syllable that emerged from the actors’ mouths and every reference to Australian forests. Uncle Vanya was in Avoca and Avoca was in Uncle Vanya, disturbing any sense that we were experiencing an ‘historical’ play. Also thrown into confusion were audience and actor roles. Not only did we move and sit among them, but for 15 minutes after each act we were invited to stay in our character, as audience, and they as characters in the play. This was charming, if disconcerting at first, but during and after Act 3, all hell broke loose. That Act, the dramatic climax, had the usual fighting, betrayals and recriminations ‘on stage’ and shooting and shouting ‘off stage.’ There were gasps from some of the audience, tears from others—and I admit both from me. So when I encountered the culprit, the Professor (Uncle Vanya fans will remember it was his presence that set everything off and falling apart) in the hallway on my way out, I had a lot to say. What surprised me was how I engaged with him. How could he, I demanded angrily, have acted so abominably, upsetting everyone, concerned only with his own selfish desires? Yes, I actually said this to the Professor, who, true to his character, spat back coldly that he was only thinking of his daughter, then turning away, slammed a door in my face—putting an end to our own play-within-a-play. I was shattered and exhilarated—this was definitely a first for me in play-going experiences. At every turn, Uncle Vanya in Avoca offered another surprise. As in a Jean Luc Godard film, the unfolding process was made visible and audible and palpable. Particularly striking was the way that, with deft hand and voice the presence of director Bagryana Popov wove through every scene, as she responded to the actors with smiles, nods, furrowed brow and at times even some gentle prodding. Her energy and commitment inflected and infected the event. In the first few minutes of Act 1 when Popov went up to an actor and whispered in her ear, a frisson went through the audience—what was happening here? We knew suddenly that audience, actor, director—not to mention Anton Chekhov—were up for a phenomenal rethink, remix and re-experience and so they were, as this unique and innovative two-day theatre experience unfolded.